CARB-X is a global partnership dedicated to accelerating antibacterial research to tackle the global rising threat of drug-resistant bacteria. With up to US$550 million to invest, CARB-X funds the best science from around the world. The CARB-X portfolio is the world’s largest early development pipeline of new antibiotics, vaccines, rapid diagnostics and other products to prevent and treat life-threatening bacterial infections. CARB-X is funded by the US Department of Health and Human Services Biomedical Advanced Research and Development Authority (BARDA), part of the Office of the Assistant Secretary for Preparedness and Response (ASPR), the Wellcome Trust, a global charity based in the UK working to improve health globally, Germany’s Federal Ministry of Education and Research (BMBF), the UK Government’s Global Antimicrobial Resistance Innovation Fund (UK GAMRIF), the Bill & Melinda Gates Foundation, the world’s largest foundation dedicated to improving the quality of life for individuals around the world, and receives in-kind support from National Institute of Allergy and Infectious Diseases (NIAID), part of the US National Institutes of Health (NIH). CARB-X headquarters are at Boston University School of Law. Protect humanity from the most serious bacterial threats by accelerating antibacterial product development. Accelerate a diverse portfolio of high-quality antibacterial products towards clinical development, focusing on the priority bacterial pathogens identified by the WHO and CDC. The world urgently needs new treatments, as well as improved use and stewardship of existing antibiotics in humans and animals, to tackle the rising global threat of drug resistance. CARB-X is funding the best science around the world to accelerate the development of new antibiotics, vaccines, diagnostics and other life-saving products. CARB-X and the innovation it accelerates are an essential part of the solution. CARB-X provides financial, scientific and business support to accelerate the development of products focused on the most serious drug-resistant bacteria identified by the WHO and CDC. The goal is to support them through the early stages of product development and Phase 1 so they can attract private or public investment for further clinical stage development. CARB-X is investing up to $550 million between 2016 and 2021 into the research and development of new antibiotics, vaccines, rapid diagnostics and other life-saving products to tackle the global threat of drug-resistant bacteria. CARB-X was created in response to the US government’s 2015 Combating Antibiotic Resistant Bacteria (CARB) initiative, and the UK government’s call in 2016 for concerted global effort to address the growing drug-resistance public health crisis. CARB-X was launched July 28, 2016, by two divisions of the US Department of Health and Human Services (HHS): the Biomedical Advanced Research and Development Authority (BARDA), which is part of the Office of the Assistant Secretary for Preparedness and Response (ASPR) and the National Institute of Allergy and Infectious Diseases (NIAID), part of the National Institutes of Health (NIH). CARB-X is funded by BARDA, Wellcome Trust, Germany’s Federal Ministry of Education and Research (BMBF), the UK Government’s Department of Health and Social Care through its Global Antimicrobial Resistance Innovation Fund (GAMRIF), and the Bill & Melinda Gates Foundation. NIAID provides preclinical services to CARB-X-funded research projects. CARB-X is headquartered at the Boston University School of Law. CARB-X’s Global Accelerator Network provides business, scientific and technical expertise and services to CARB-X-funded product developers to support their antibacterial research projects. The Network also plays a key role in addressing common challenges facing the antibacterial product development community. Antibacterial research is scientifically challenging, costly and takes years. 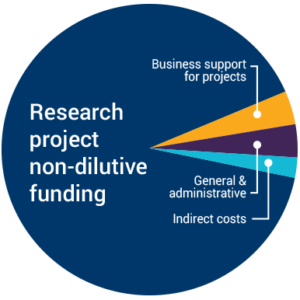 CARB-X supports projects through the early stages of development so they can attract private or public investment for further clinical development. The boxes below show how many Powered by CARB-X researchers and product developers raised additional investment as of September 30, 2018, the total they raised, the leveraging power of the CARB-X funding and the number of IND/IDEs filed.